A unique combination of ceramic and carbon fiber materials joining together to make this fine Men's chronograph a instant sensation. 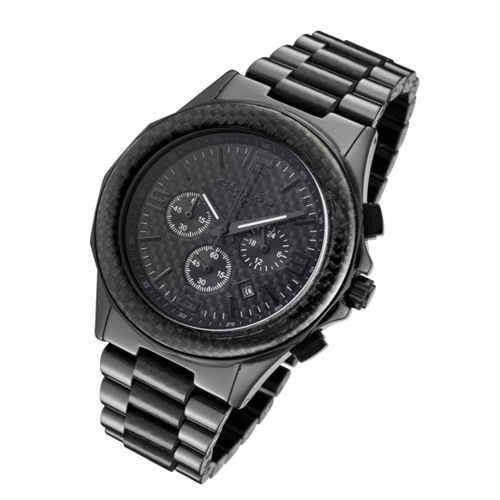 High polished black ceramic watch with accented black carbon fiber on the bezel, band and dial give this Cirros Milan Stallone Men's Carbon Fiber Chronograph watch a character all on its own. The push buttons and screw down crown that are on the right of the case, the hour markers, and the dodecagon (12 sides) that surrounds the bezel are black color. 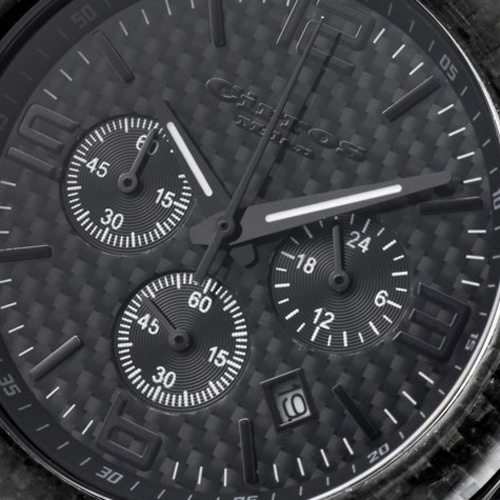 At the center of the dial there is an inner black carbon fiber circle with the brand name Cirros Milan proudly imprinted in black across two lines and three subdials below, each with a white border. At the three o'clock position is the hour subdial, along with seconds at the six o'clock position, and the minutes at the nine o'clock position. This gorgeous dial also features a date display window with a black rectangular border between the four and five o'clock position and is protected behind a scratch resistant sapphire crystal.